As the “Amazing Grace” sets sail for a voyage to the South Seas, Torre DeRoche looks down and contemplates one of her toenails. It bears a remnant fleck of nail polish, a last shred of her former life as a two-feet-firmly-on-terra-firma graphic artist from Australia about to embark upon a life at sea. Until this point, DeRoche’s greatest adventure has been to leave her big, boisterous family in Australia for what was meant to be a three hour tour—whoops-year—in San Francisco. But when Torre meets Ivan, an Argentinean IT project manager with an unwavering dream of sailing the South Pacific, her best laid plans go through the proverbial porthole. Soon enough, DeRoche takes the plunge, with anxiety, humour and a darn-good putty-knife. Some days are better than others en route to French Polynesia. Postcard sunsets and unspoiled tropical islands are interspersed by knocking about in squalls, seasickness so severe it has Torre bunk-ridden for days or bailing a bilge that fills faster than it drains. And while Ivan is not exactly Gilligan, he’s about as accident-prone as they come. No sooner has Torre patched him up from one mishap than he’s gone on to the next one and coco-bonked himself all over again. 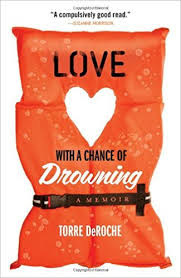 Love With a Chance of Drowning acts out many a marine metaphor for relationships as Torre and Ivan take theirs all the way from smooth sailing to choppy waters right up to on the rocks. There they land, stronger, wiser, and, at least in Torre’s case, confident that a person can be fearful, funny and adventurous all in one.